Growing evidence suggests that exosomes and their contents contribute to the formation of the pre-metastatic microenvironment and to non-random metastasis patterns [8–10]. Exosomes are constitutively secreted by almost all cell types and can transport proteins, lipids, DNA, and RNA to recipient cells . They contain many of the important raft lipids found in cellular membranes, such as ceramides, sphingolipids, cholesterol, and glycerophospholipids . The principal RNA of exosomes is miRNA [13, 14], but they also contain long non-coding RNAs (LncRNAs), which regulate gene expression in many ways . The biological characteristics of exosomes are summarized in Fig. 1. Although only 0.01% of tumor cells in the blood stream can spread to distant sites, metastasis occurs frequently, and exosomes have been proposed to increase its success rate [21, 22]. Zomer et al. have reported that aggressive breast cancer cells promote the metastatic capacity of less-aggressive tumor cells, largely by transferring exosomes containing functional RNAs . In the early stages of metastasis, exosomes participate in the sequential steps involved in both modulating tumor cells and establishing a distant pre-metastatic niche [24–26] (Fig. 2a). 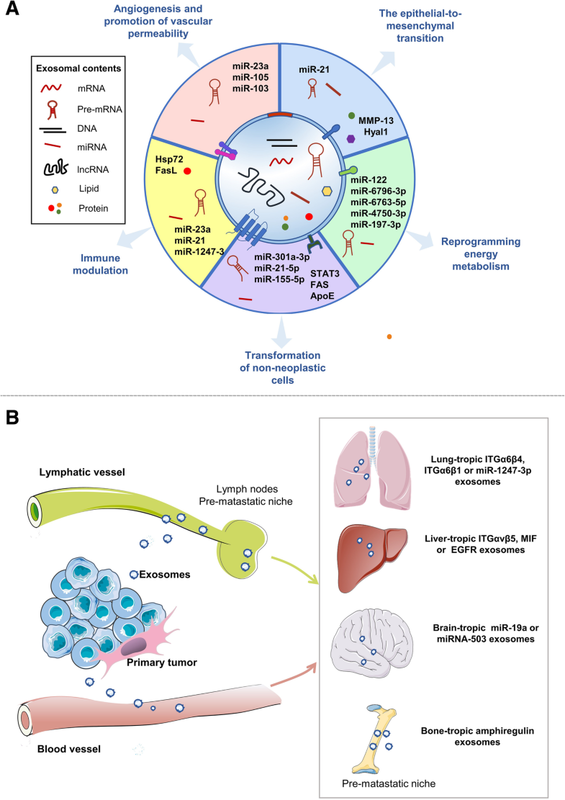 Metastasis is an organ-specific process in animal models that is not only dependent on the pattern of the vasculature or lymphatic vessels, but also on the tumor cell characteristics and host factors involved . Many studies investigating the mechanisms of organ-specific metastasis have highlighted the roles of tumor cell traits, including the genes and pathways involved in the regulation of organotropism [17, 70–74]. Moreover, Fais and his peers have reported that microenvironmental pH is one of the factors influencing metastatic sites, since exosome fusion and interactions with the acceptor cells are affected by the microenvironmental pH [75, 76]. In the following sections, we will focus on the role of exosomes in organ-specific metastasis (Fig. 2b). Given their high physicochemical stability and biocompatibility, exosomes can be chemically or biologically modified to yield delivery systems that can enhance the treatment outcomes of chemotherapeutic agents, as well as reduce drug toxicity [106–110]. One study has found that exosomes can be used to deliver doxorubicin specifically to tumor tissues through intravenous injection, decreasing tumor growth without overt toxicity . In addition, Ohno et al. have shown that exosomes can efficiently carry let-7a miRNA to EGFR-expressing breast cancer cells in animal models . Genetically engineered exosomes have also been shown to inhibit schwannoma tumor progression by delivering suicide mRNAs and proteins . Finally, research in zebrafish has demonstrated that exosomes can increase the uptake of drugs in the brain, demonstrating their capacity to function as delivery systems for anticancer drugs targeting brain metastasis . Second, the tumor microenvironment is linked to the progression of various stages of tumors . It will be important to explore how components of the tumor microenvironment affect exosome behavior [117, 118]. It is also pivotal to learn more about the roles of exosomes in metabolic changes related to metastasis . For example, Abhinav and colleagues have devised an experimental and computational platform to analyze exosomes with different metabolite components in various environments, which is helpful for understanding the metabolic alterations in tumor microenvironment components; however, the platform still needs to be optimized . Consequently, it will be interesting to determine whether exosomes can be used as markers for disease progression and treatment [120–122]. Third, the precise roles of exosomes in organ metastasis need to be further defined. The knowledge of which component of exosomes is responsible for tissue specific targeting, local environment modification, and possibly immune alteration should be investigated. In particular, the mechanism involved in brain metastasis should be a research focus because of the unique repercussions of the blood-brain barrier for cancer and the potential for future therapeutic development. Recently, He C et al. have proposed that RNAs are responsible for the major functions of exosomes, a conclusion that suggests new directions for research into the functional contents of exosomes . Although therapeutics based on exosomes are promising, there are several significant issues that must be addressed before exosomes can be tested clinically: 1) Standard guidelines for the manufacture, purification, storage, usage, duration, and dosage of exosome-based drugs remain to be established, since it is reported that surgical intervention may trigger local hypoxia and inflammatory response, both of which are relevant to metastasis [124–127]. 2) It must be verified that the sources of the exosomes are safe for clinical use . 3) How the acceptor cells can be protected by removing any carcinogenic components of the exosomes must be investigated . 4) How interactions between therapeutic exosomes and unexpected cells can be avoided must also be examined . 5) Is it feasible that only autologous exosomes be used? Under what circumstances can heterologous be explored? 6) Is it promising to design exosome-based drugs targeting the hallmarks of cancer metabolism ? 7) Since many studies have focused on the application of exosome-based vaccines as alternative approaches to suppress tumor growth , is it meaningful to develop exosome-based vaccines to prevent metastasis? Significant progress has been made in characterizing the role of exosomes in tumor metastasis, and the therapeutic potential of using exosomes or their derived vesicles is entering an uncertain but exciting stage.